CARLSBAD, Calif. (Jan. 6, 2018) – It was a colorful day of scoring for Tyler Schafer, but nonetheless, he made it around Aviara Golf Club in even par. That was enough to set up Schafer, a freshman at Long Beach State, with the first-round lead at the AmateurGolf.com San Diego Amateur presented by Callaway. Schafer, who logged a top-5 finish at the 2017 SCGA Public Links, made his first bogey at No. 2 but quickly recovered with a birdie at No. 3. He followed with one more of each on the front nine before an eagle at the par-5 eighth sent him to the back nine at 2 under. Schafer went on to make two bogeys, three birdies and a triple, but it all added up to 72. The next-closest player to Schafer is Jake Elliott, who went 3 under in his final two holes (thanks to an eagle at the par-5 17th) to finish the day at 74. Three players are tied for third at 3 over, including Matt Fry, Alex Locke and Jamie Cheatham, a redshirt junior at Cal. 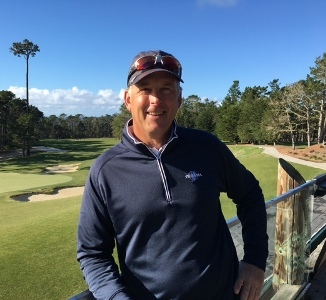 In the senior division, a very steady round brought Jeff Britton to the top of the leaderboard. Britton had three birdies and two bogeys to go with it, but perhaps more impressively, he didn’t have a single three-putt on Aviara’s undulating greens that were running 13 on the stimp meter. Britton’s deft putting touch certainly helped him get ahead on a day when many players in the field lost ground with 3-putts – and a few 4-putts – on the greens. Britton, a familiar face in AmateurGolf.com tournaments who finished T-2 at the AmateurGolf.com Christmas Classic to end 2018, will take a three-shot lead on Nicholas Bock into the final round. Michael Horan is third with a 4-over 76. Three players – Steve Donnelly, Gene Walsh and Michael Harding – are tied for fourth with rounds of 5-over 77. April Ranches, a freshman at San Diego State, is leading the women’s division after a 2-over 74. Ranches made the turn at 2 under, but double bogeys on two of her final three holes pushed her over par for the day. Brianna Steger, Daniela Anastasi and Jaime Jacob are tied for second at 5-over 77. In the net division, Dorothy Donnelly leads with an even-par 72. Chris Ladd and Korsen Yu are two shots behind her in a tie for second.